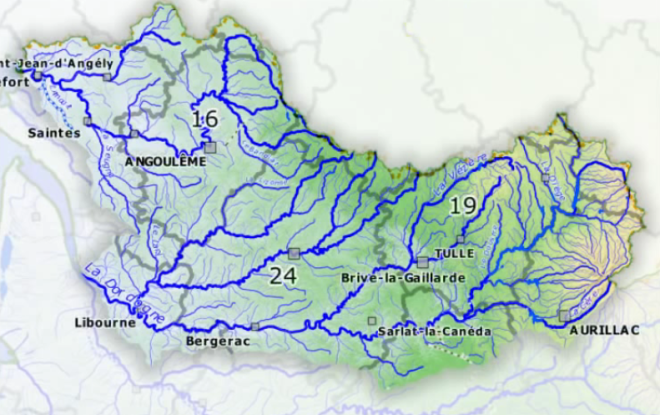 The Adour Garonne French Water Basin agency is financially and technically supporting actions of integrated water management policy in great Sout West of France. The water agency chose to migrate since 2008 its whole GIS infrastructure to Free Open Source Software by converting previous proprietary maintenance fees to financial contribution to all the tools required and hosted by OSGEO. Thanks to an original frame public tender, allowing small and fast contracts, and rewarding good contribution practices by a 5% reward when source code is well committed upstream, Oslandia came as being the main involved partner for PostGIS / QGIS training and QGIS based coding. The water agency chose to migrate its spatial infrastructure centered first on a data focus, using postgis as a high availability provider for geographic datas and processing services. The European Water Framework Directive pushed geospatial data in the core of its reporting and decision making policy, letting no choice but being able to handle a major rise of geospatial uses. The infrastructure was made to host millions of yearly river, lakes and groundwater monitoring results and GigaBytes of geospatial reference datasets, serve it to existing tools, allows efficient data science analysis and Open data casting to public portals. That project success allowed the agency to go beyond its goals and deploy dynamic decision making applications for wastewater pressure assessment and start porting that QGIS application to a QGIS server based application to allow collaborative work with all the involved partners. Fix slowlyness of identify tool that led to whole renderer on the fly simplification, and major speed improvements. Documentation both in english and french. A more detailed report of contributions is available there.